TRIPTI: she is tripti 4 some. tj n trips 2 others. 4 me she is simply angel coz tats wat she is an angel. i met her on da 25th dec. 4 all u fools out its christmas. i was depressed more than ever tat day n she came into my life n rescued me. actually she came online. i wish she could c da image i have of her in my mind. she is beautiful. i bet she is beautiful in person 2. she is so kind n sweeeeeeeeeet. she has got an amazin voice but i don't understand y she is so concerned abt speakin 2 much. if she doesn't she is robbin ppl of tat glimpse at heaven tat tey reach wen listenin 2 her voice. i asked her out, now i feel really bad tat i did coz i can never come close 2 her expectations n i know tat there r guys who can give much more than i can ever think of. the only downside is dat she never sleeps. 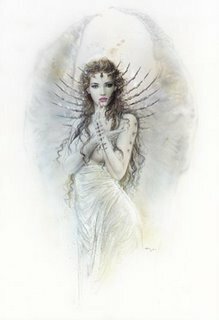 i guess angels don't coz tey have 2 rescue all da bruised souls out there like me. thank u angel. luv u a lot never wanna let go of u.